The dust has barely settled on Crusaders’ title celebrations, but skipper Colin Coates is already plotting next season’s Premiership defence. The Crues were crowned champions last week afterretaining the Gibson Cup for the first time in the Seaview club’s history. 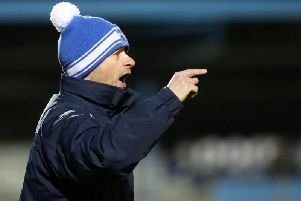 The challenge will be whether Stephen Baxter’s side can make it three on the bounce next term – a feat only achieved by Linfield and Belfast Celtic. “When you hear only Linfield and Belfast Celtic have won three on the bounce in the history of the Irish League, it acts as a massive motivation,” Coates said. “It’ll be a big ask. Linfield have been very consistent since Christmas and if they carry that form into next season, they’ll be a big threat. Glenavon are also a team on the rise and they are maybe only a few players shy of putting up a serious challenge. Crusaders complete their Premiership campaign away to Glentoran on Saturday afternoon. Coates is hoping they can finish the season on a high note. “Last season we won the title with 82 points, so we’re already six points better off, but we want to try and break the 90 points barrier,” he added. Also on Saturday, Irish Cup finalists Glenavon and Linfield meet at Mourneview Park, while Cliftonville travel to Coleraine. SECTION A FIXTURES: Coleraine v Cliftonville; Glenavon v Linfield; Glentoran v Crusaders.